Nass, Wilson, and Pardee Destroy Detroit! Matt Nass, (11) Jacob Wilson, and Sam Pardee took down the Hall-of-Fame super-team in the finals to become the champions of Grand Prix Detroit! Running back two-thirds of the team from Grand Prix Nashville, Nass/Wilson/Pardee ended on top, above (17) Shahar Shenhar, Matt Costa, and Brock Parker; (T-13) Owen Turtenwald, William Jensen, and Reid Duke; and de facto "Team Hall of Fame" (25) Ben Stark, Luis Scott-Vargas, and (2) Eric Froehlich. It was a staggering feature-match area. There were 125 Grand Prix Top 8s in the Top 4, and the young bucks were victorious. This will be the Top 4 that people are talking about a decade from now, and they'll talk about how it was three friends—who team up just because they like each other—who took it all down. Good morning from Detroit! Yesterday was the largest Team Limited Grand Prix in history, with 680 teams (beating Grand Prix Utrecht 2013 by three teams). Today, the field is down to a paltry 56. There are only five more rounds to crown the Top 4; that means it’s going to get intense. Starting with a distinct advantage, are the two undefeated teams: (13) Owen Turtenwald, William Jensen, and Reid Duke, known colloquially as “Peach Garden Oath;” and the triple Pro Tour Hall of Fame team (though one is Hall of Fame–elect), (25) Ben Stark, Luis Scott-Vargas, and (2) Eric Froehlich. The second is a newer team iteration, but perhaps they could be called “Pork Ben Oath”—as this team without Stark, and with Paul Cheon, is called the “Pork Bun Oath.” These two teams, sitting at 9-0, only have five rounds to defend their top spots. 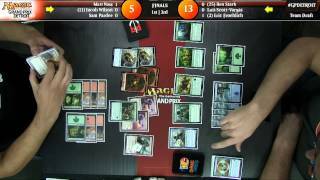 Chasing them are tons of strong teams, like Jesse Hampton, new Player of the Year (1) Mike Sigrist, and (T23) Paulo Vitor Damo da Rosa. And even Cheon’s own new team, with Tom Martell and (21) Alexander Hayne. Team Limited Day Twos are slightly different that the norm. Players must build a second Team Sealed pool for five more rounds—then we cut to Top 4 and Team Draft, the best format ever invented. Can the “Peach Garden Oath” and the “Pork Ben Oath” keep their top spots? We’ll see over the next five rounds. And most likely, these two colossal teams will be playing in the first round. 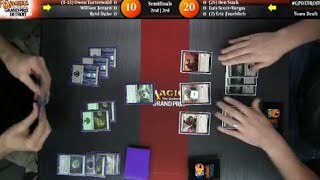 So if I were you, I’d tune into to twitch.tv/magic2 right at 11 am EDT to catch the action. We’ll be here all day. The first nine rounds of Magic Origins Team Limited are in the books here in Detroit! There’s an old adage about team formats that veterans of the format know well—the top tables get stacked. And that’s certainly the case here. Playing in the last round, the three remaining undefeated teams were: (25) Ben Stark, Luis Scott-Vargas, and (2) Eric Froehlich; (13) Owen Turtenwald, William Jensen, and Reid Duke; and Jesse Hampton, (1) Mike Sigrist, and (23) Paulo Vitor Damo da Rosa. That’s insane. There are almost as many Pro Tour Top 8s in those nine people than there are cards in each of their Sealed decks. Team Sealed can be the most skill-testing when it comes to building—and also friendship testing. The tighter knit you are, the better the long tournament will go. It’s no surprise that such strong teams, and such strong friends, find themselves near the top. After the last round, it was only Owen, Huey, and Reid (the “Peach Garden Oath”) and Stark, LSV, and EFro (perhaps the “Pork Ben Oath”?) who remained 9-0. Going into the second day, they’ll have a huge advantage for making the Top 4. But there’s still lots more Magic to be played. Magic Origins has now shown itself impressive in almost all formats, and by tomorrow’s end, we’ll even have some Magic Origins Team Drafts under our belts too. For anyone who’s frequented the hotel lobbies after Magic event in the last few weeks knows that Magic Origins is great for that too. Tune in tomorrow for all the action bright and early at twitch.tv/magic2. The hashtag for Grand Prix Detroit is #gpdetroit. Join the conversation!